Homemade Halloween costumes are so much better than anything you can buy in the store (not to mention, much cheaper!). This Halloween, be sure to set aside some time to make your children costumes. We rounded up 22 of the cutest outfits to get you started. Your kids are sure to love at least one of these costumes, if not more! Learn how to make a headless bride costume. Although this idea has been around for quite some time, it proves that imaginative design will last. Just think how much good old-fashioned Halloween fun your children will have trick or treating with this unusual ensemble! A unicorn costume can be made with a little bit of effort and a lot of creativity. Lia Griffith offers templates to make a headband with ears and horns, a glitter leaf necklace, and felt hooves. Your child will be the cutest unicorn on the block. Every little girl will love being a beautiful monarch butterfly for Halloween. Pieces of felt are glued onto a black cloth to make the most stunning butterfly wings. Is your child the future Sally Ride? You never know! Make this adorable astronaut outfit for your baby boy or girl this Halloween. All you have to do is fuse iron-on patches onto a navy blue coverall. Fast and so, so easy! Show the world that you are a Game of Thrones family. Mom can dress up as the beautiful Daenerys Targaryen, the "mother of dragons," and all the kids can be the baby dragons. This costume is perfect for last-minute crafters. All you need is a yellow winter hat, pipe cleaners, and a toilet paper roll. This Minion costume is a quick and easy ensemble your kids will love! Have you ever seen the classic play Little Shop of Horrors? It features a giant plant named Audrey 2 that eats people. You can make a kinder, gentler version of the giant houseplant costume this Halloween. It's different, simple to make, and everyone will love it. The Wizard of Oz is a movie that every generation loves. 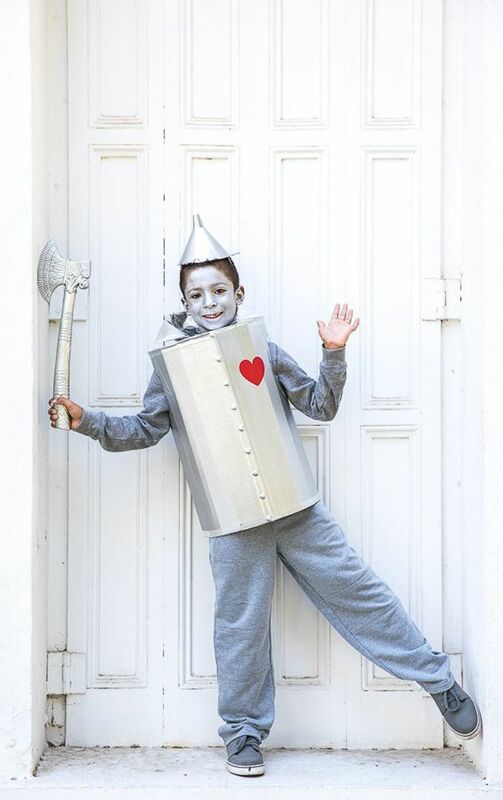 Remember the Tin Man who had no heart? Make your cute version from a cardboard box, spray paint, and yes—duct tape! If you are willing to spend a bit of time and work through a learning curve, you can make your child a zombie costume that utilizes makeup techniques similar to ones used on television programs such as the Walking Dead. Your little zombie will be so scary, that you may even frighten other children. Is your son a fan of the movie Toy Story? He just might want to be the character Woody for Halloween. Woody is such a fun costume to make and is a character that everyone will recognize. This costume is like no udder! What an adorable costume that younger children will love. It's comfortable, cute, and warm for a chilly Halloween night. You don't see this costume every day. Mac and cheese loving kiddos will get a kick out dressing up as their favorite meal! And believe it or not, just like the boxed version, this costume is super easy to make. Do you live in a place where the weather is still warm on Halloween? Get tropical with this pineapple costume for babies! Your little fruit will be the cutest fruit in the bunch! This fairy costume is so gorgeous, it's hard to believe it's homemade! Every little girl will feel like a woodland princess wearing this ethereal outfit. Garden gnomes are traditionally male and thought to be magical. Gnomes protect your house and garden. Make this cute gnome costume and experience the magic of Halloween. Every Harry Potter fan knows that Ginny Weasley is Harry Potter's future wife. While attending school at Hogwarts, Ginny was sorted into the Gryffindor House, which is reflected by the patch on the cape. Your child can pretend to be part of the Hogwarts School of Witchcraft and Wizardry, too with this fantastic Hogwarts uniform costume. Everyone loves the timeless Carmen Miranda. All you need is some fruit on your head and lots of attitude. This one is easy to throw together in a pinch. Sometimes all you need to make the costume is an accessory. Make a spooky spider web headband, and you're ready to celebrate Halloween. This costume idea is no-fuss and perfect for the school day if your kid isn't ready to sport their full costume just yet. Everyone loves the mythical unicorn! Here's another take on the popular costume idea: Decorate a baseball cap with extra large googly eyes, rainbow-colored yarn, and a metallic gold horn. Voila! Instant unicorn costume. Breakfast is always the most important meal of the day! Siblings can make a statement on Halloween with a cute breakfast themed ensemble. Social media is such a part of our every day lives that it's even become a part of Halloween, too. It's so easy to make a snap chat puppy filter costume for Halloween—just don't forget to snap it to all your friends! Let's go old school this Halloween with adorable woodland animal felt Halloween masks. Be a cute owl, fawn, or fox this year!